This is a lesson I'm creating for one of my education courses. You can view the original post I wrote here. Have students bring in a pet stuffed animal from their home. Ask students if they think they can determine an object’s weight and size without using standard tools. Write the children’s answers down on the SmartBoard. Then, try out their answers to see if they are right. Next, read the book Measuring Penny by Loreen Leedy to show students ways to measure a pet without standard tools. Have students predict which pet is the longest, tallest, shortest, widest, and thinnest. Choose a nonstandard tool for measuring. Have students record their pet's measurements (ear, eye, nose, mouth, head, paw, arm, leg, tail, body). Also, have them write down the name of the longest, tallest, shortest, widest, and thinnest pet in the class. Next, they will estimate which pet is the heaviest and which is the lightest. For science, construct a balancing scale. Provide the materials and have students infer how they can use the material to create a weighing device. Then, weigh your pets! Have them write down the pets' names in order from lightest to heaviest. Afterwards, have them weigh their pet and compare it with pennies. What does their pet weigh in pennies? 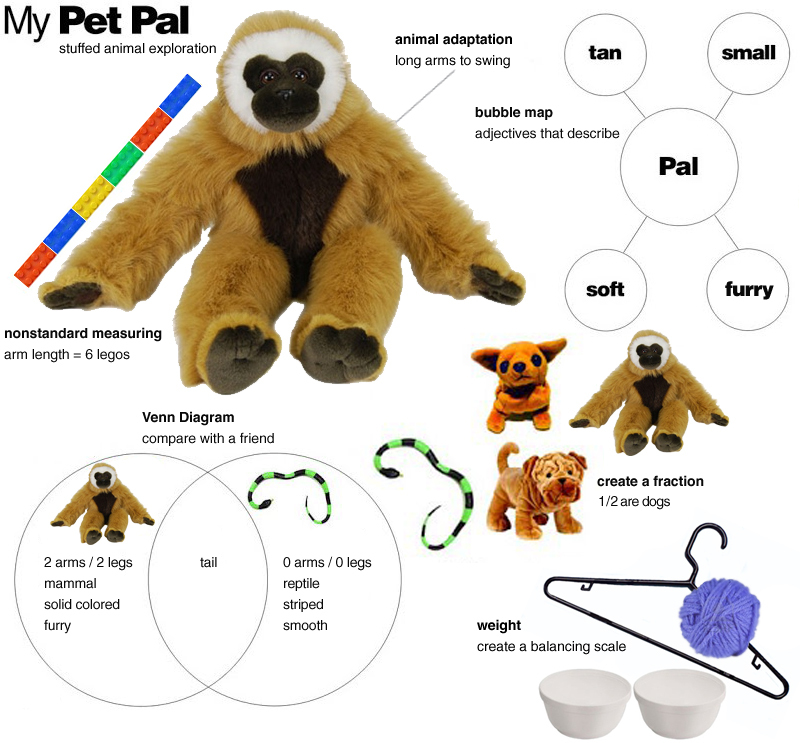 Then, students will describe their pet’s attributes using a bubble map. What makes their pet unique? Then, they will compare their pet to a friend's pet using a Venn diagram. Once they compare with one friend, they will create a fraction by finding other peers whose pets have similar and different attributes. For writing, have students write down how they think their pet’s attributes might help their pet (animal adaptations). Why does their pet have large ears? How does long shaggy hair help their pet? Where would their pet live? After they've made an inference, they will work in teams to research all of their pet’s attributes on the computer or ipad to find out how certain attributes (like large ears) help animals.